January 2014 saw another succssful Summer School. Thank you to everyone who attended in helping make it such a great 3 days of learning, exploring, meeting new friends and hopefully there will be some newly self-published books out there for us enjoy soon too. Thank you also to Waimea College for the use of your great facilities and support from Tasman Creative Communities - its much appreciated. 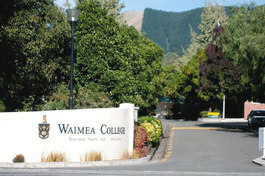 We choose Waimea College (Salisbury Road Richmond) as our venue because it has well-equipped classrooms which are perfect for special demands of the summer school workshops. The school also has attractive indoor and outdoor spaces where students are able to gather for refreshments and to exchange ideas and enthusiasms.